The springs involved in a garage door’s operation are integral to the proper functioning of the door. When one of the springs breaks or malfunctions, it will have a negative impact on how a garage door works. The springs in a garage door are under high levels of pressure and really should not be repaired by a homeowner or other do-it-yourselfer. The springs should be repaired by a trained and qualified technician like those with Garage Door Springs Channelview. These repairmen will get the garage door working like new again in a short period of time. The employees at Garage Door Springs in Channelview offer broken spring repair and broken spring replacement for all makes and models of garage doors. They also work on the various operating styles of garage doors. Garage door springs come in two different types, torsion springs and extension springs. The springs in a garage door counterbalance the weight of the garage door and make it easier for the motor and chain or belt to pull the garage door open and closed. Replacing the garage door springs can have added difficulty because there are usually other parts connected to the spring which can add a level of difficulty to the repair. For these reasons, garage door repair should only be done by professionals like those at Garage Door Springs Channelview. Torsion springs on residential garage doors are either single springs or a pair of springs installed on a metal pole over the garage door. Commercial garage doors usually have at least four torsion springs. The torsion springs balance the garage door by applying pressure to the pole. The spring winds and unwinds as the door opens and closes. The wire size, inside diameter and lift determine how long a torsion spring will be useful before the spring breaks. 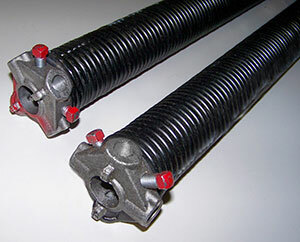 Garage Door Springs Channelview will know how to repair the torsion springs in your garage. The extension springs are located along the sides of the garage door or above the horizontal tracks of the opening system. These springs provide a counterbalance to the weight of the garage door by expanding and contracting when the door opens or closes. Most residential garages have two extension springs, one on each side of the garage door. Commercial garages and some larger residential garages will have more than two.